AuDeo are a visual communications company specializing in video conferencing, telepresence and digital signage solutions. Since 2008 the company joined forces with us to provide engaging corporate communication solutions to businesses across the UK. ‘’The flexibility of Dynamax’s technology gives us the ability to provide clients with unique, scalable digital signage solutions that suit their requirements’’ says Ian Hancey, AuDeo’s Technical Director, commenting on our partnership. The company has recently created an impressive presentation suite for British commercial property owner MEPC, using our software to power digital information displays that showcase their estates and welcome visitors. You can read the case- study here. AuDeo has also set up digital signage solutions run by our product for two pharmaceutical companies, one of which using the system for internal communications and the other, a newly established pharmacy, using the system to share medical information and advice in their main area and entertain children in a special designated section for them. The company actively promotes the technology on their blog and has worked with us to offer white papers (such as Digital Signage for Corporate Communications) and video presentations of digital signage on their website. They are also assisting end-users with the creation of content and the design of templates for their screens. AuDeo’s vision of helping businesses decrease communications- related costs and improve productivity matches our own and we look forward to working with them on more exciting projects in the future. ‘’Dynamax were always extremely helpful, their technical support is quick and the cases were always resolved efficiently. Their initial support was invaluable to us in putting together our signage solution.’’ Sarah concludes, talking about our partnership. 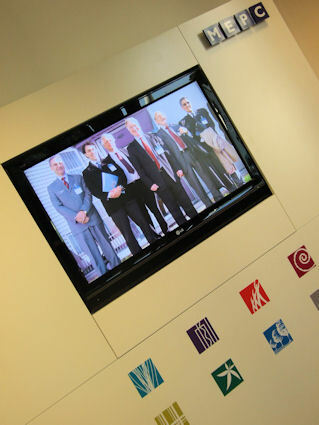 This entry was posted in and tagged AV technologies, digital signage, digitalsignage.NET by Dynamax. Bookmark the permalink.